The Trail Riders ministry is a group of Christian riders who enjoy spending time in God's beautify country on their horses. Pastor Dean leads the group in prayer, and then it is off on an enjoyable ride. There is a group of 10-15 riders of various ability and faith denominations. All riding levels are welcom. 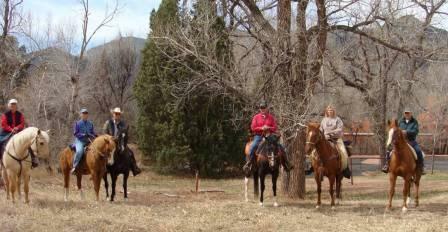 We have held locals rides in Douglas and Elbert counties. We have even traveled to ride at Garden of the Gods in Colorado Springs.